Fuji Xerox DocuPrint CM415 color multifunction printer. It has been designed using the latest technology platform to target general office customers in the Corporate, Government and Education sectors. DocuPrint CM415 leverages the same powerful features and capabilities as the ApeosPort-V A3 Series colour series and combines with the workflow solution platform to create breakthrough offers for customers looking for a common experience for their end users, as well as IT Administrators. Xerox DocuPrint CM415 uses a touchable, tiltable 7-inch touchscreen that utilizes visible technology in smartphones and tablets by allowing users to operate the device intuitively, to make it faster and more efficient. DocuPrint CM415 can print and photocopy you as fast as 35 ppm, with first page load time as fast as 10 seconds. The print resolution of 1200 x 1200 dpi produces compelling colour images that draw attention and clear text. Other optional features mean greater flexibility. Dramatically improve the efficiency of your workflow with these optional onboard scanning features: making text-searchable PDFs, scanning to USB devices, plus high compression technology to reduce file size. Add customized workflow solutions through the ApeosPort solution platform. Fuji Xerox productivity improvement software tools can be installed directly on the device for quick and easy access via a color touchscreen interface. 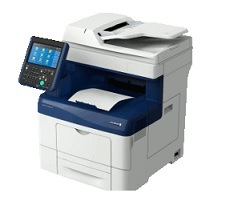 Download the Xerox DocuCentre CM415 driver according to the Operating System on your PC or laptop at the link below.